Traffic deaths have been going down, but a new study from the Centers for Disease Control and Prevention shows they are still a bigger problem in the United States than in other affluent countries. 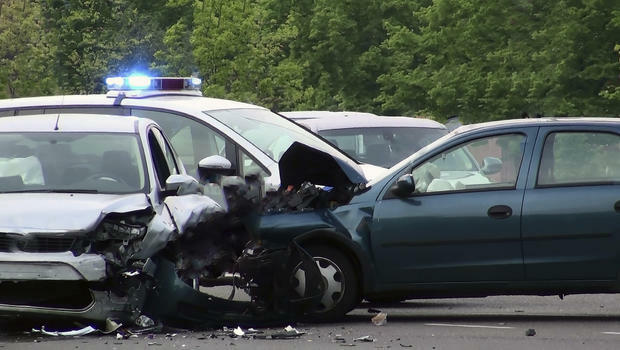 According to the government report issued today, about 90 people die each day from motor vehicle crashes in the U.S, by far the highest fatality rate for car crashes of the 20 countries studied. The rate in 2013 was more than twice as high as in most of the other countries. Traffic deaths haven't been dropping as fast in the U.S. either. The rate has fallen by nearly a third since 2000. Every other country studied had a steeper decline. "It is important to compare us not to our past but to our potential. Seeing that other high-income countries are doing better, we know we can do better too," said Dr. Debra Houry, director of CDC's National Center for Injury Prevention and Control said in a statement. "People of our nation deserve better and safer transport." If the U.S. had the same crash death rate as Belgium (the country with the second highest death rate after the U.S.), for example, about 12,000 fewer lives would have been lost and an estimated $140 million in medical costs would have been saved in 2013. If the U.S. had the same rate as Sweden, the country with the lowest motor vehicle crash death rate, approximately 24,000 fewer people would have died and an estimated $281 million in medical costs would have been averted that year. Specifically, the report found 1 in 3 crash deaths in the U.S. involved drunk driving, and almost 1 in 3 involved speeding. Front seat belt use was also lower than in most other countries in the study. In a statement, the National Safety Council said it is "frustrated" by the report's findings. "Despite our vehicles being safer than ever before, we still lose 100 people every day in car crashes, and we are on the wrong side of the trend," the statement reads. The CDC recommends drivers and passengers take the following precautions to protect themselves in motor vehicles. Drive without distractions (such as using a cellphone or texting).